Members of Rotherham Council are set to debate the contentious issue of fracking this week with the ruling Labour councillors hoping to pass a motion that would commit the authority to not allow any fracking activities on Council land. The motion, put forward by Cllr. Beck and seconded by Cllr. Wilson, comes as the authority deals with its first shale gas related planning applications. INEOS' oil and gas exploration and production business has two proposals on Greenbelt land in the Rotherham borough where it has also been carrying out seismic testing. A site at Harthill was first identified as an exploration site and a second site at Woodsetts has now been selected. Both sites have been identified as being in an area of interest to INEOS based on existing seismic data. 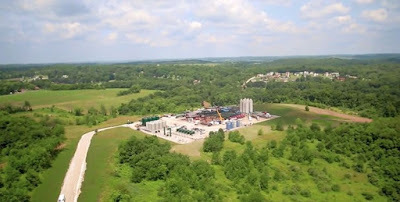 The proposals involve building a drilling rig and drilling vertically, deep into the ground (around 2,800m) to find out how much gas is in the shale. This does not involve fracking. INEOS claim that that there would be no detrimental impact on the local environment from its proposed 60 metre high shale gas testing well at Harthill. Rotherham Council is expected to schedule a special meeting of the planning board in November given the large number of representation letters that have been received. A breakdown of the representations shows that 1,009 are objecting to the proposals and 0 are in support. As well as putting forward general objections to fracking, the objections focus on the potential impact on highway safety and wildlife, the visual impact, noise and geological issues related to mining. An application for the Woodsetts site is due to be submitted shortly. The motion to Rotherham Council, notes that all planning applications relating to fracking must be considered on their merits in planning terms, within the rules set out by the Government, but asks that the Council, "commits to not allow any fracking activities, including survey work, on Council owned or controlled land and property." INEOS claim there will be no detrimental impact on the local environment! Clearly there will be some. It's just a case of how much! We do not need or want this in our area, however small INEOS claim the chance of any significant impact is. Fracking is the only weapon the world has against the illegal cartel of OPEC whose sole purpose is to drive up oil prices and increase profits for the Arab countries.Support the Arabs if you must, but it amazes me that such support comes from a borough whose wealth emanated from Coal.What impact did Coal have on our environment Fracking will have minimal impact compared with coal. How do you know the comment was from a man? Women can be foolish too.